Brian and I had planned on a trip to Ireland this coming fall, but with my six month stint of general unemployment, it really doesn’t seem feasible to spend thousands of dollars on an international vacation. So we’ll stay close(r) to home. And do Disney! While Brian has never experienced the magic that is the wonderful world of Walt Disney, I have visited four times in my lifetime. Planning our upcoming trip has brought back a swarm of memories of the Happiest Place on Earth. 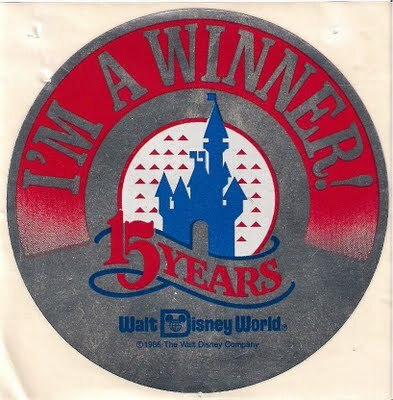 My first trip to Disney was when I was just barely a toddler–old enough to remember bits and pieces, but too young to remember it all vividly. At 3, I knew that we were going on our first big vacation, but I don’t remember the excitement of visiting the Magic Kingdom. That first trip, Mom, Dad, Deven, Brian, and I woke up bright and early before the sun rose to hop in the old station wagon and make our way south. I remember falling asleep in the living room and waking up to Deven telling me that it was time to go. Mom and Dad packed my little brother and I (still in our pajamas) into the way back of the station wagon with stuffed animals, blankets, and pillows, where we promptly fell back asleep. We woke up somewhere between Illinois and Florida and tried to keep ourselves entertained. With our big sister lounging across the center seat of the wagon, we stayed in the back and she tried to keep us from boredom as best as a 14 year old girl can do. We stayed at several different hotels throughout the course of our vacation, including one situated on the beach for our first ocean excursion. During one of our hotel visits, I was swimming in the large public pool when I suddenly became violently ill (after accidentally consuming a little too much chlorinated water), releasing a swarm of death from the inner pits of my stomach through my mouth and right into the pool. I believe that the pool was quarantined for the rest of the day and possibly into the next. Oops! Then we made our way to the Magic Kingdom, where they were celebrating their 15th anniversary. As the lucky 500th person through the gates, I won my very first major prize. Little three-year-old Chrissy won a free pass to Disney World, which was valid for life. Of course, we used it when I was 10 and the fam had returned for our second Disneycation. I remember some of the rides, but not all of them. Mr. Toad’s Wild Ride was my absolute favorite, and I was heartbroken when I discovered that it was no longer there. I was riding in the car with Deven and she let me “drive.” She kept telling me that I was going the wrong way, but I was laughing so hard I couldn’t stop. I was terrified by the Peter Pan ride because it really felt like I was flying, and I thought that there couldn’t be anything more fun than the Haunted Mansion. The last memory I have of that trip was just a day that I had with my mom. We drove to Treasure Island together while Brian, Dad, and Deven stayed at the hotel. We visited my great grandma Myrt and great-grandpa Warren. That was the only memory that I have of my great grandma, who passed away some time after our visit. She was so nice to me, and she gave me stuff to color, while I was sitting on the floor of her bedroom. My mom seems surprised every time I tell her that I remember being there, but I do. As I gear up for my upcoming Disney trip, I’ll be sharing the more vivid stories and entertaining tales of Disney over the next few weeks. I’m stoked.